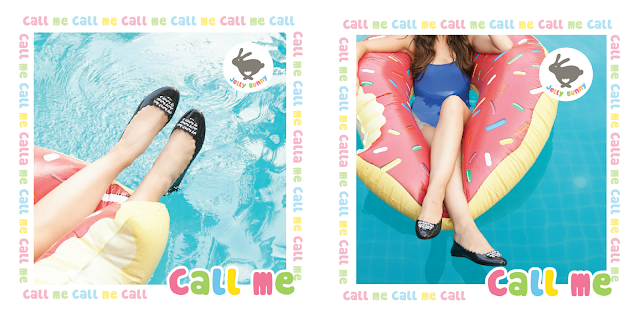 Introducing Jelly Bunny latest Spring Summer Collection '15 which revolves around the theme 'Sweet Glam'! This concept consist mainly of charming and playful designs - the brand's distinct signature and with color palette: warm violet, French blue, light purple and rainbow! I have always admired Jelly Bunny shoes because of how cute and lovable the designs are and the colours! Ah the pastel colors are just so pretty. The brand constantly experiments with different shapes and colors, with plenty of love and attention to detail. Specially designed ornaments are constantly used to bring out the playful factor and the unique factor of Jelly Bunny products is definitely the texture! The unique texture of Jelly Bunny products is achieved through an innovative manipulation of non-toxic, easy-to-clean materials such as PVC and silicone. This creates the soft jelly-like texture which also has a sweet vanilla scent incorporated into the shoes. So you can imagine my excitement when I first received the secret invitation to Jelly Bunny Tea Party!! I could barely keep the secret of the party and seriously how nice were they to actually send an invitation card to my house a few days before the actual day! Held at Full House Signature, Sunway Pyramid I knew I would definitely be having an amazing time with Jelly Bunny! Ok let's get back to the main topic! Just look at the pretty Spring Summer '15 collection! Love the little details that they added to the collection making it so unique and eye-catching! The colors are so vibrant and no worries if you want to wear it to the pool because well.. they are Jelly Bunny!! Also on the day of the Tea Party, we were given some advice on how to change your look from Day to Night with Jelly Bunny and how Jelly Bunny products are also elegant despite the jelly texture! Stop by any Jelly Bunny stores now and check out their pretty Spring Summer collection to rock your outfits!